The moment I've been waiting for has come. METROPOLITAN BANK & TRUST COM. ( MBT ) has finally announced the details of the 30% stock dividend for shareholders. Here's the news from COL Financial which I am sharing with you. When Do I Buy Shares To Ensure I Get The Dividend? To ensure you get the dividend, buy shares BEFORE the EX-DATE. Those who hold the shares a trading day before the ex-date will receive the dividend. Therefore, since August 29 is MBT's ex-date, make sure you buy MBT shares on August 28 at the latest or you sell your shares (if you have) after August 28, 2013. When Will I Receive the 30% Dividend? What's the Minimum Amount I Need to Buy MBT Shares? Price per share: 110.10 pesos as of August 16, 2013 closing time. If the price of MBT shares remains the same as of August 16, 2013, you only need 110.10 pesos * 10 shares = Php 1101 to buy the shares (plus charges that will most probably not exceed 30 pesos). If it becomes lower, then it's much better. You'll get 10 shares at a lower price. Grab this very good opportunity to own additional shares of MBT for FREE. Buy or hold your shares until August 28. The MORE shares you hold, the MORE shares you get for FREE! P.S. For those who want to get stock market guidance, I recommend you join Truly Rich Club. It's more than just a club for me. It is a blessing. I didn't get my 30% stock dividend yet. I bought the stocks of 100 shares last Aug 2. I should have 130 shares in my portolio by now. Any reason why I don't get it? Thank you. Ex-date is August 29. You should be able to get the dividend. I was able to get mine already. Please check with your online broker. It should be automatically paid as of yesterday night. By the way, who's your broker? I got mine today... Please check your portfolio and it should be reflected today. If not, kindly contact COL on this. Are you a truly rich club member? I was hoping you kept the shares. MBT is a good company (long term). We're projecting that it will reach more than 100 pesos. But at least you still have the 90 shares. 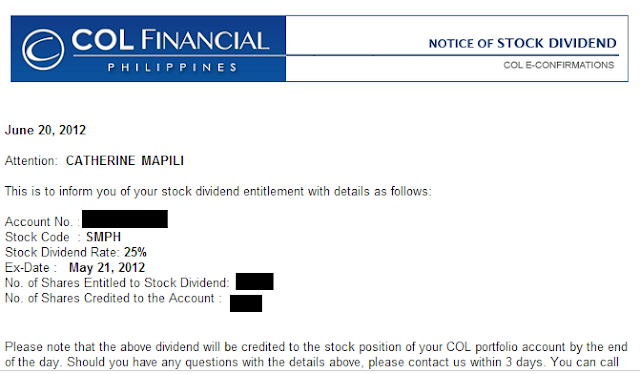 congratulations for getting the dividend!